Inter-annual variation in tissue mercury concentrations in birds can result from annual changes in the bioavailability of mercury or shifts in dietary composition and/or trophic level. We investigated potential annual variability in mercury dynamics in the Antarctic marine food web using Pygoscelis penguins as biomonitors. Eggshell membrane, chick down, and adult feathers were collected from three species of sympatrically breeding Pygoscelis penguins during the austral summers of 2006/2007–2010/2011. To evaluate the hypothesis that mercury concentrations in penguins exhibit significant inter-annual variation and to determine the potential source of such variation (dietary or environmental), we compared tissue mercury concentrations with trophic levels as indicated by δ15N values from all species and tissues. Overall, no inter-annual variation in mercury was observed in adult feathers suggesting that mercury exposure, on an annual scale, was consistent for Pygoscelis penguins. However, when examining tissues that reflected more discrete time periods (chick down and eggshell membrane) relative to adult feathers, we found some evidence of inter-annual variation in mercury exposure during penguins’ pre-breeding and chick rearing periods. 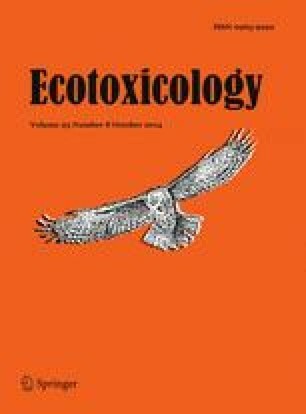 Evidence of inter-annual variation in penguin trophic level was also limited suggesting that foraging ecology and environmental factors related to the bioavailability of mercury may provide more explanatory power for mercury exposure compared to trophic level alone. Even so, the variable strength of relationships observed between trophic level and tissue mercury concentrations across and within Pygoscelis penguin species suggest that caution is required when selecting appropriate species and tissue combinations for environmental biomonitoring studies in Antarctica. Funding for this research was provided by a United States National Science Foundation Office of Polar Programs grant (Grant No. ANT0739575) to S. Emslie, M. Polito, and W. Patterson. For their assistance with sample collection we thank the US Antarctic Marine Living Resources program researchers at the Admiralty Bay field camps including W. Trivelpiece, and S. Trivelpiece. We thank Raytheon Polar Services and Lockheed Martin for logistical support. D. Besic, B. Drummond, K. Durenberger, E. Guber, A. Hydrusko, T. Prokopiuk, C. Tobias and E. Unger provided helpful assistance with sample preparation and stable isotope analysis. This study was conducted under approved animal use protocols from the Institutional Animal Care and Use Committees at the University of California San Diego (S05480) and the University of North Carolina Wilmington (A0910-020) and in accordance to Antarctic Conservation Act permits provided by NSF OPP to S. Emslie (2006-001), R. Holt (2008-008) and G. Watters (2011-05).